Solid shelves are reinforced with aluminum cross members. Shelves are adjustable; tighten to post with allen wrench/hex key. 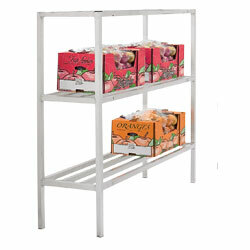 Shelves feature 1-3/4" x 1-1/2" open cross tubes. All-welded. FOB CALIFORNIA, GEORGIA, PENNSYLVANIA, TEXAS. Choose either shelves with 1-3/4" x 1-1/2" open cross tubes or reinforced solid shelving with cross tubing reinforcements underneath. Unassembled. FOB CALIFORNIA, GEORGIA, PENNSYLVANIA, TEXAS. YA-7801 26	 3	 22-1/2"	 48x20"	 60"
YA-7802 29	 3	 22-1/2"	 48x24"	 60"
YA-7803 36	 3	 22-1/2"	 60x20"	 60"
YA-7804 40	 3	 22-1/2"	 60x24"	 60"
YA-7805 44	 2000	 4	 36x20"	 76"
YA-7806 56	 2000	 4	 36x24"	 76"
YA-7807 56	 2000	 4	 48x20"	 76"
YA-7808 68	 2000	 4	 48x24"	 76"
YA-7809 68	 2000	 4	 60x20"	 76"
YA-7810 76	 2000	 4	 60x24"	 76"
YA-7811 58	 800	 4	 36x20"	 76"
YA-7812 60	 800	 4	 36x24"	 76"
YA-7813 68	 800	 4	 48x20"	 76"
YA-7814 72	 800	 4	 48x24"	 76"
YA-7815 76	 800	 4	 60x20"	 76"
YA-7816 84	 800	 4	 60x24"	 76"